Title-“Stick Man” First sequenced post. Posted is ‘The Doodle’, from Sketch Book Six, February 2013. This selection is from the +12 portion of the project-Doodles selected by friends/artists. This one was selected by Pat. 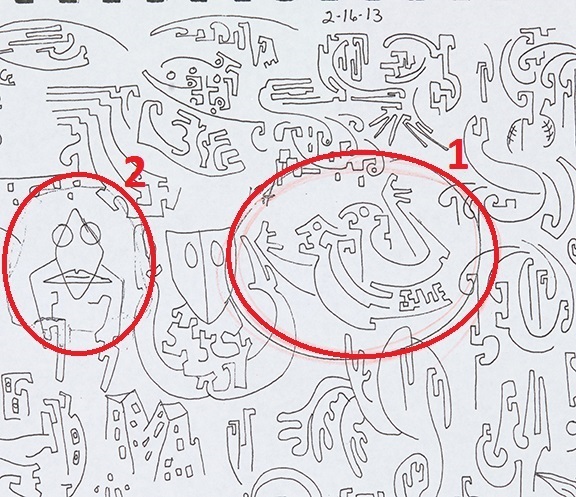 She chose the circled ‘doodle’ number One-showing two figures. In contemplating what design would develop from these ‘two guys’ the most important question was: Do I use just these two figures or can I add additional figures to them. While looking at these characters, I happened to notice the ‘doodle’ in circle number Two. I had always had an interest in this face but felt it was best suited for a “Thumbnail Sketch” drawing. So another question was, could I somehow work the ‘face’ into this design. .
How I resolved combining the two is on next Monday’s ‘Worksheet’ post as well as why this painting is named “Stickman”. I can’t imagine how these two doodles will end up being “Stickman”. It will be a real surprise to see what you do with this one ! Thanks for commenting Sherry, these two doodles don’t form the ‘stickman’. There is a third ‘doodle’, at least I think there is, that cropped up in my head. I can’t find it in my sketchbooks, so I don’t know if it’s real or not but something about this extra ‘doodle’ seemed to want to be in this painting so I named it after ‘him’. This reply is pretty much what I will write again when I post the Worksheet, so don’t tell anybody. Your secret is safe with me! Looking forward to seeing the “elusive Stickman.